Over the weekend we rolled out a new line of amazing patina products at B'sue Boutiques : Swellegant Metal Coatings, Patinas and Dye Oxides. You will want these, OH YES!! you WILL. 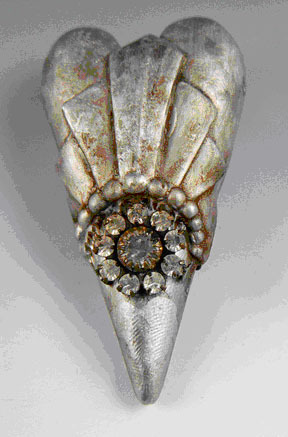 The Swellegant line is based on the Sculpt Nouveau patina products. Some of you know about them and have used them, with great success. 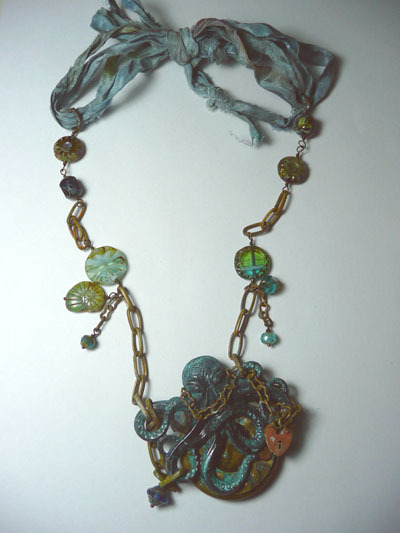 I was thrilled when reknowned polymer clay artist, Christi Friesen, experimented with and deciphered these patina materials in a way that is SAFE and EASY! to use in your home workshop. The products are packaged in small bottles that are simple to use, and very economical. You'll be able to afford the whole line and it will provide many hours of creativity and discovery for you. We all know there's a big difference between Diamond Glaze and Ice Resin. We all know Diamond Glaze has its place, but it's a crafts product, same as Ranger Glossy Accents. If you want a quick finish, you might grab either of those. But.... if you want to do some serious, durable resin work, then you use ICE Resin, which is a jeweler's grade product. Swellegant is of that same ilk, like Ice Resin. It's the GOOD stuff, the stuff that serious artisans will want to discover and explore. But, it's NOT hard to use! There are five metal coatings, which are actually like a sort of paint that has real metal in it, immersed as fine dust into the medium, with a binder. The Patinas are just that: patina products that will alter the surface of whatever you put them on, makining them dark, or rusty, or green, or green-gold----just as patina does. They are slightly acidic. Dye Oxides are dyes. They have a certain transparency to them, but they soak in and become part of whatever you apply them to, making them strong, but still preserving the look, detail and integrity of what's underneath them. Swellegant will work on a wide variety of materials: metal, polymer clay, paper, foam, wood, plaster, ceramic, glass. All of the Swellegant line is shippable as NON-HAZARDOUS and the toxicity is low. Clean up is soap and water. Smell? I don't detect a lot with the metal paint or much with the dye-oxides except when you heat the dyes. To me, alcohol inks have a stronger smell. The patinas, being acidic, smell like Gramma's been in the kitchen, making pickles. If you get it on your hands it will tingle. If your skin is sensitive or dry, it may irritate....so: wear gloves. Don't eat while using it, never ingest it, keep it off your skin, and an apron is also good as the dyes really are dyes and can be messy. Keep it away from your eyes. A pair of goggles in never a bad idea, you do NOT want to get patina products in your eyes. Having a package of wet wipes near by is also recommended. And again, you might want to wear a plastic apron that you can throw away, or make a cover for yourself out of a plastic garbage bag. Shake all the bottles really well before opening, and open them AWAY from yourself. This is because there could be some natural expansion of gasses when you shake them, and the liquid may burp a little when you open the bottles. Using Swellegant really just comes down to standard workshop safety. Again, be sure to shake up all the bottles real well, while tightly capped, and open them AWAY from yourself. Pour out just a little of whatever you are using and then, recap the bottle so the product does not dry out. I'd recommend picking up one of those little artist palettes w the tiny wells in them, or something you improvise from materials you have in your workshop, that would work in such a way. If you are working with metal, you must thoroughly degrease RAW BRASS, which commonly comes from the tooler with a bit of machine oil on it. Do this by washing with hot water, soap, thorough rinse and dry. Plated brass is already cleaned but it's a good idea to wipe it down a little, anyway. Distressing plated brass before using the Swellegant products is recommended, especially flat blanks with no surface texture. The same would go for the raw brass blanks that you've degreased. This will give the surface more interest as well as a little 'tooth' for the product to grab onto. To distress: a nail reliefing block, or fine steel wool. For all other materials: just be sure the surface is free of any other mixed media product or dirt, and you're good to go. Use a soft brush or a bit of sponge, or better yet, sea sponge to DAB the product onto the surface. Painting it on will usually leave streaks, so a dabbing motion is preferable. Cover the surface the best you can on the first coating. On polymer clay: you can apply before OR after baking, experiment and decide what you like best. If you're intending, however, to add patinas, etc, you might want to bake first (we will get to why, later.) 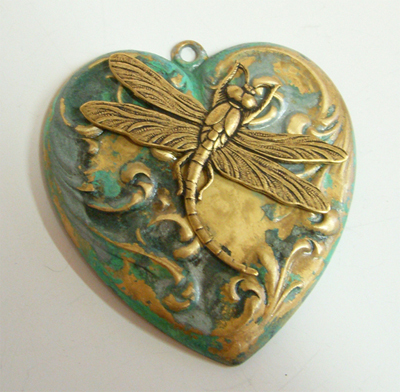 If you use the metal coatings over clay, go lightly so that details are not obscured, the same on highly textured brass stampings. Let it dry for about 15 minutes. Then you can go back and fill in with a second coat. Mix the metal colors if you want! Dabbing on product also can create texture that makes more surface interest that will more easily accept patinas and dyes. The more metal coating you layer, the stronger and more scratch resistant the work becomes. A light third layer of metal coating is advised. If done over metal coating, do it while the coating is STILL MOIST. Immediately add the patina with a brush or sponge. You can also put the patina in a little mister bottle like some use for misting paper crafts materials with color, and mist-spray on the patina. In places the blackness cut back to the more copper-ochre under layer and looks almost chocolate! 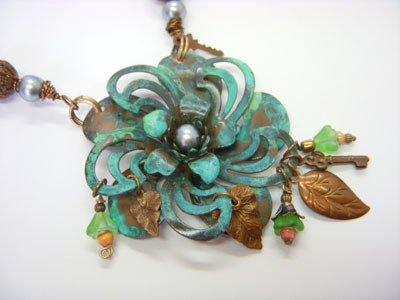 The DARKENING patina works the fastest, and produces rather a deep verdigris effect. The TIFFANY and GREEN-GOLD take longer to react. The piece above took about an hour to 'bloom'. At first when you sponge on the patina, it may look as though nothing is happening. Give it a good 5-10 minutes and you will begin to see a little reaction starting. There are many factors regarding 'bloom time': it could take 15 minutes, it could take several hours. Keep an eye on it as you go about another project in your workshop. When the bloom reaches the desired level, you must stop the reaction. Keep a bowl of water nearby, and gently rinse the surface of the piece of with water. If you do not stop the reaction, it will just keep on going until you do. After rinsing, gently blot dry with paper towels. If you aren't satisfied with the reaction, no big deal! Do it again, until you are! These are colorants in the form of stains. They are actually a *type* of patina, as they soak into the metal and become part of the piece. They are NOT just a color that, like paint, lays on top of the piece. The colors are intense but transparent. You can add just a whisper of color or layer them for a much bolder look. Yes! You can mix them! To have success in adding just the dye oxides over bare or plated metal, you need to heat it first. Please refer to the tutorial above (or locate it at the B'sue Boutiques website under Tutorials) for instructions on how to use a torch or embossing gun to heat the metal. But, if you've ever used alcohol inks over brass, the process is similar. If you are working with metal and have heated it, drop it into the dye oxide (as shown in the tutorial above) or being VERY CAREFUL *not! * to touch the metal, dab-sponge on the color. After adding the dye-oxide, then heat set it again. Some use a torch but honestly, I'd go with an embossing gun, I think it's easier and safer and there is no flame. Want to add more color? Let it set and cool down about 15 minutes, and then repeat. Again, you can use any of the products alone, but some of the most interesting patina/colorization looks are achieved by layering them all: first the metal coating, then patina, then a bit of color with a dye oxide. It's not totally necessary, but I would seal this product when the desired effect is achieved. The Swellegant line includes a clear sealant product. This would go on after you let the piece set at least a day or two: the full recommend is 72 hours but it may go to conditions in your workshop such as room temperature and humidity. Shake the sealant well before using. Brush it on in a VERY THIN layer; if you put it on too thickly, it looks milky and you don't want that. The clear sealant IS made expressly to go over the Swellegant coatings, patinas and dye oxides. It's absolutely FLAT and adds no shine. I have found that Krylon spray lacquer works well. I've used it over the patina piece above. I used the matte lacquer straight over the patina, no sealant, two lightly misted coats. It worked very well. Krylon makes a shine product that should work equally well. You can find it in a hardware store or Walmart. Clean up your mess with soap and water, and make your new components into amazing new creations! After adding all the product desired, maybe you're thinking, hmmm. Maybe it needs a little something more! You can pop the metal coloring by going back over everything with just a teeny bit of metal coating on your gloved finger, smearing lightly just over the top of the high spots. Sometimes it's even more interesting to go back over with a contrasting color. For example, brass over bronze is a great look; silver over iron is really pretty. In the long run, if you don't like it, wipe it off and start over, going over the piece with metal coating again. Layering is amazing! 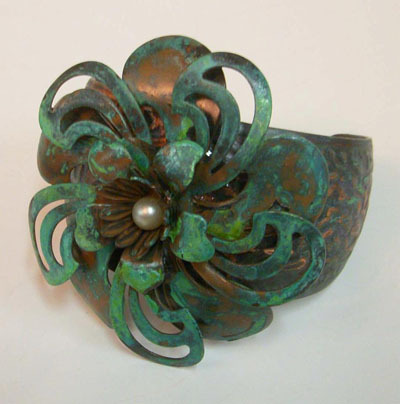 Layer the patinas, dye oxides, metal coatings! BURNISHING: Before doing this, you MUST wait 48 hours to let everything cure. Then, use a cloth, burnishing wheel or the finest steel wool possible. Burnishing will remove a thin layer from the surface and makes the metal glow. It is very much like distressing the patina finishes on B'sue Boutiques brass findings. Chain from Linzi Alford's Patina a Rainbow tutorial.